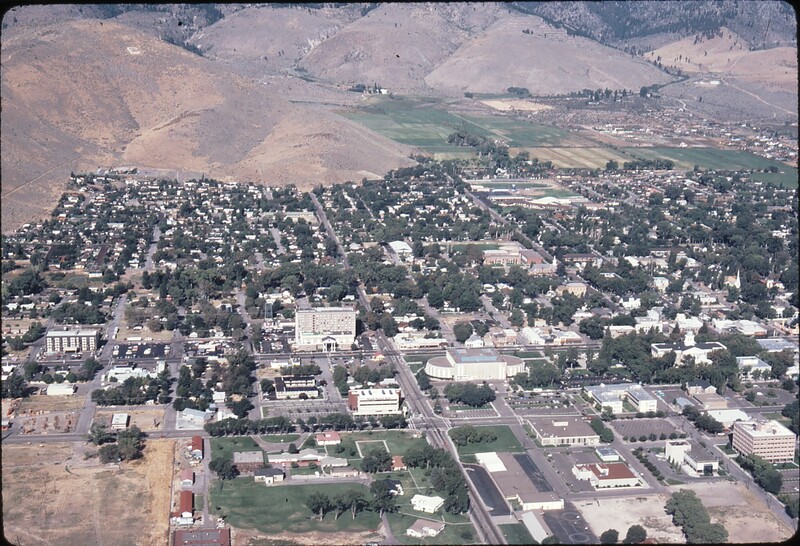 It’s an aerial view of downtown Carson City, taken around 1981 or so. You can click on it to see a much bigger version and check out all the small details. But even though Carson looks mostly the same today as it did 25 years ago, there are still some major changes that have taken place in certain spots, so if you’ll indulge me for a bit I want to grab some closeups from this picture and take a walk through history. This is the original Ormsby House. Long before it underwent the recent renovations, it looked like this: brown, kind of ugly, with a portecochere facing Carson Street. At this point the hotel was about ten years old, and it hadn’t even received the expansions that were yet to come in the 1980s. In this photo the building is still symmetric; a few years later the Loftins would add onto the north side, expanding the casino to fill the block all the way to Fifth Street. Adding that much square footage allowed the Ormsby House to offer more dining on the ground floor. But, surprisingly, the second floor of the new addition was never used. It just sat empty ever since the day it was built. Also the Ormsby House hadn’t built its signature parking garage yet. You might not even recognize what you’re looking at here. 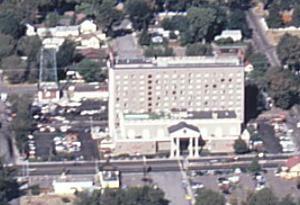 This is the Mother Lode Hotel and Casino, on Carson Street between Ninth and Tenth. It may not look familiar, but that’s because 25 years and several expansions later, it’s been transformed into what you know today as the Carson Station. Back then, not only did it have a different name, but it didn’t have the sprawling casino it does now. Everything was confined to the hotel’s footprint, and you could park out in front of the building. This school campus, at the corner of King and Thompson Streets, is today the home of Bordewich-Bray Elementary. But there’s a history here that goes beyond the kindergarten classes that are held here today. 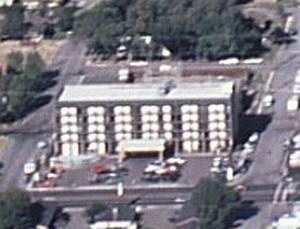 The central building in this picture, the stone one facing the camera, was built in 1936 as Carson City’s High School. It served that purpose for decades, until the population of the town outgrew the building. The red brick building to its right was built later in the century, and the campus was changed to an elementary school and named for Grace Bordewich, an English teacher at the high school. When I attended Bordewich in 1985, the old high school building was still standing, but condemned and off-limits. 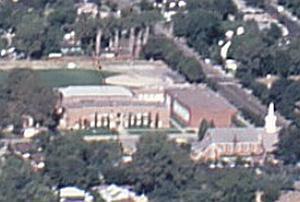 It was finally demolished sometime in the 1990s to make way for a new cafeteria and office for the school. 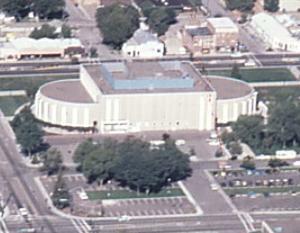 The is the Nevada State Legislature Building, before its expansion in the 1990s. Back then it was just one little squarish building, with two wings for the two houses. Now, of course, besides having a complete facelift, there is also a huge office building added on to the back of the Legislature. This picture was also taken before the parking garage was built at the corner of Fifth and Stewart. Back when you could park amongst the cottonwoods. This squat little shoebox is the Nye State Office Building, located at Stewart and Third Streets. If it doesn’t look familiar to you, that’s because it doesn’t exist anymore. It was demolished in 1990 to make way for the State Supreme Court. No big loss; in fact, its replacement is much more worthy of being part of the Capitol Plaza. 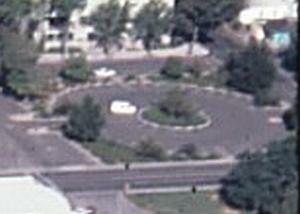 Speaking of the Capitol Plaza, look at the area around the Nye Building in this picture. Second, Third and Plaza Streets were all still there, and you used to be able to parallel park right behind the Capitol. All of that has been redone now, of course, what with the new Supreme Court and State Library buildings being built, and sidewalks replacing the roads. 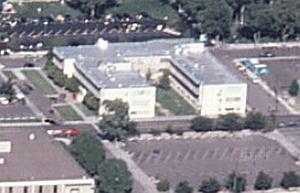 Now the Capitol Plaza covers fifteen whole city blocks in the heart of town, where the original plat set aside was only four blocks. I don’t know why, but I love this little circular parking lot at the corner of Musser and Stewart Streets. Now, of course, it’s buried under the bulk of the Nevada State Library and Archives Building. But it seems like such a blatantly inefficient use of space, you have to give it points for temerity.